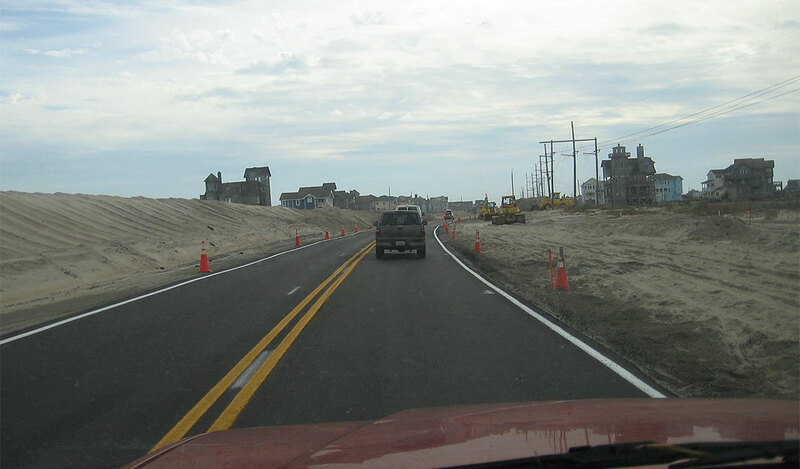 Bill's OBX Beach Life: Introducing the 2010 Quatro Tempo, What a Hatteras Rhythm! Introducing the 2010 Quatro Tempo, What a Hatteras Rhythm! 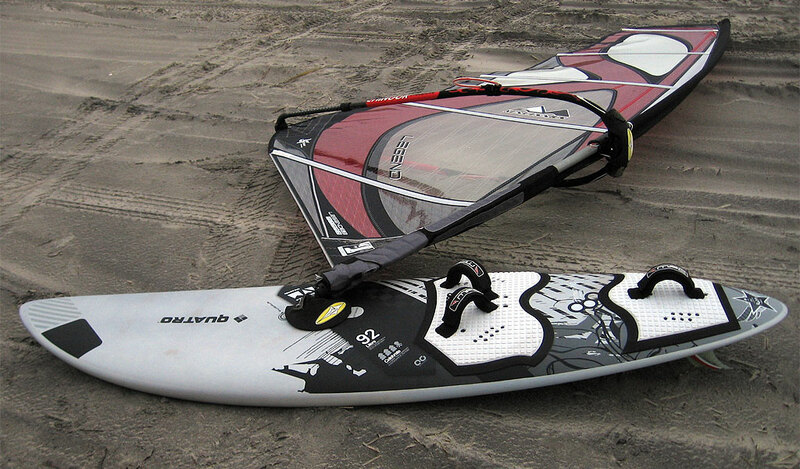 This weekend I introduced the 2010 Quatro PVC Tempo 92 to three solid days in the Hatteras Atlantic. The board was designed for conditions as found in Hatteras and its rhythm was hot during both the side-on and side shore sessions offered! The first sesh was side-on at Coqunia Beach near Oregon Inlet, Friday, Nov 20. North wind was on tap and provided powered 17-22 mph wind. Perfect for the Tempo 92 with plenty of float to remain well powered with the 5.3m 2010 MauiSails Legend. The board provided a quick plane for the trip out through the white zone, as well as a snappy bottom and loose top turn courtesy of the twin fins. 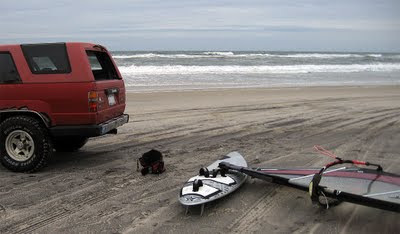 Holding the upwind tack was no problem on the Tempo with no risk of washing ashore downwind from the launch at my truck. I was solo at Coquina, but it was quite a fun afternoon sesh! 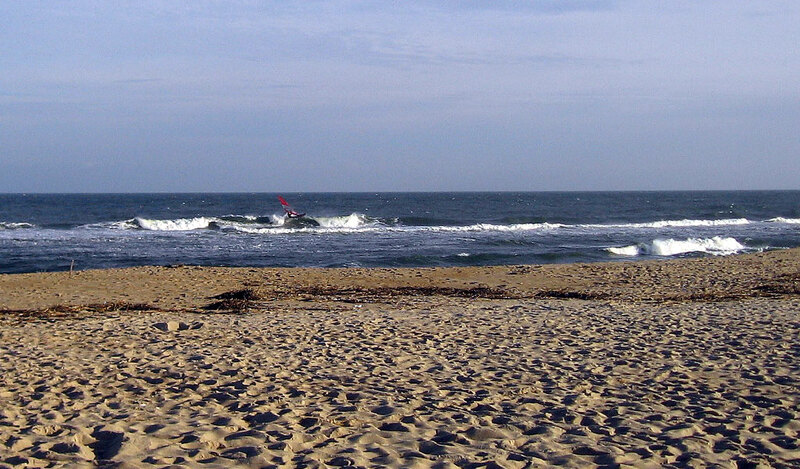 Saturday, the winds ratcheted up a notch, and after arriving late for the side-off to offshore clean fleeting conditions at Izzys near Hatteras Village, I trekked back north to the Lighthouse and caught some fun head high sets in side shore N wind. Again the Tempo shined with plenty of loose feel for the setup at takeoff as well as the DTL ride. Heading out through the whitewater, the board had plenty of float; though with average winds hitting 25 with gusts near 30 mph, I could have likely been on either my 76 Quatro Wave or the 4.7m Legend. In these winds however; complemented with the 5.3m Legend, the Tempo flew nicely and looped effortlessly! 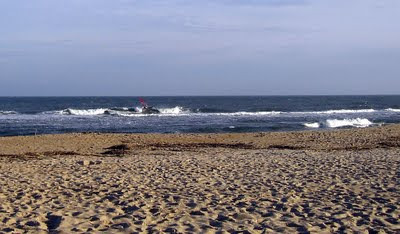 Sunday, again the Lighthouse was the call, and though the surf was a little smaller and the wind a little lighter than Saturday, an excellent lineup remained with fun chest to head high set waves and clean conditions in the lighter upper teen/mid 20 mph N wind. All in all, an excellent three day Hatteras Atlantic introduction for the new 2010 Quatro Tempo PVC 92! Only bit I missed was the side-off opportunity at Izzy's on Saturday. If I caught that sesh, the Tempo would have hit it all from side-on to full side-off over the past weekend. That's the beauty of the Hatteras Atlantic testing waters! Interested in the new Quatro Tempo? Be sure to stop by or contact Avon Sail House, our local dealer for the new ride. Thanks for the review! With all this chitter about multi-fin boards in the industry these days, I am kinda keen to try one out. But, the shortcoming in Ontario that as much as I'd love to get lots of wavesailing in, I simply do not. More often than not, my small stick is just a high-wind B&J board. I scored what will probably be my last session of the year at Sandbanks on Friday, for some smallish wave sailing, but wavesailing none-the-less! Nice Bill, I too scored fun Assateague waves on Sunday, juiced 5.0 conditions. Water still warm, and didn’t see any debri out there from the recent storms. Looks cool. It's neat to see the trend of companies making wave boards with more volume and wind range. That someone who can work with a 76 l in marginal winds nevertheless chooses to ride a 92 l speaks well for how the new boards ride. Nice review on the Tempo 92! So far are you seeing some overlap to your 76 or is the 92 just getting you on the water sooner? Are those offset strap holes on the board or is it just the pad design? Looks odd if it is offset strap positions. Forgot to ask, is Olaf riding the Tempo 92 as well? Most of the reviews (on forums and blogs) have been VERY positive for the Tempo. It will be interesting to see how they differentiate the Tempo from the quad/twinzer when they release it. Again, thanks for the great report! Yea I decided to go with the Tempo when I was first introduced to the concept that Quatro was coming out with it back in late 2008/early 2009. "A twin fin for all-around aka 'Hatteras' type conditions." 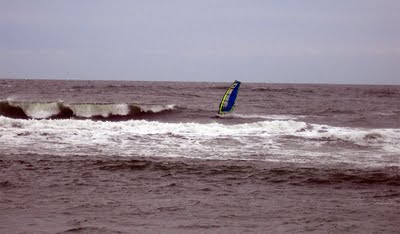 I also wanted something to ensure I could catch sessions like that offered during Hurricane Bill with clean pure side-off performance wavesailing. 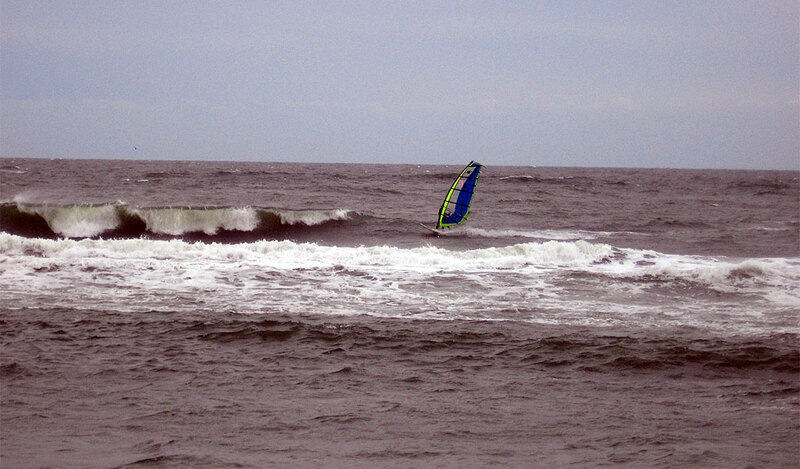 I had been a single 76er for a while and only caught the "windy" days or slogged for sets on the small board, but decided that to really enjoy the light air wavesailing, I needed a bigger ride. With the Tempo and its twins, I get the volume along with the performance needed to have fun when our surf is exceptionally clean and marginal wind is here. As for the straps, those black spots are graphics on the deck pads and are not foot strap inserts. The inserts are standard configuration, and I have my straps located forward on the board to promote light air balance and to keep me a little more forward on the board. As for the Quatro Quads, I believe they may be out now and I would love to take one out for a spin! Perhaps we can get one out here next year?! Oh yea, Olaf is also riding the Quatro Tempo. He has the Premium Wood version which has a few extra pounds weight as compared to the PVC along with some differences in material construction. Also the Wood version is pure white in color while the PVC is gray in color. Thanks for all the comments Bill! Keep the Tempo reports coming when you get more time on your new ride. Any dimensions available on the Tempo? 249cm X 58 or did they go shorter on length. hope you score many days on the tempo.